The $35 to $40 minimum Seated Liberty half dollar value is a very solid beginning. There are however many rare and more valuable dates in the series, discover the value of your coins on the chart. Here are a few thrilling dates to find. 1850, 1851 and 1852 are very rare with values topping $300 to $825 dollars each. Another treasure, look on the reverse of your 1870 and find the "CC" mintmark just below the eagle and ring up $1250 in value. The condition of your coin also has a huge impact on value and is often easy to underestimate. An 1877-CC in "Good" condition is a $49 coin but in the nicer "Extremely Fine" condition the value jumps to $206. The "Uncirculated" Seated Liberty half dollar pictured is an example of a very desirable and collectible coin, value $340 and up. With higher condition coins worth so much more it is important to judge your old coins carefully. See the section on how to "Grade" the condition of your coins below and get the most from your Seated Liberty half dollar value. The following chart reveals all are highly prized and valuable coins. The above are the wholesale Seated Liberty half dollar value. Computed from dealers price lists with various markup factors figured in. They reflect closely the value you would expect to receive when selling. Variations in value do occur subject to subtle grading points, collector demands and dealer needs. If your coin is not listed above, it is seldom encountered. For additional reference... NumisMedia publishes an extensive fair market value price guide, covering retail Seated Liberty half dollar value in detail. Finding a rare date half dollar is always possible. It does happen, although rarely. You stand a much better chance of finding a valuable higher condition, higher "Grade" coin. Collectors and dealers in order to determine any Seated Liberty half dollar value, access the condition of coins and then assign each a grade. Compare your coins to the grading images below. Look closely at the shield on the obverse. A complete "LIBERTY" on the shield separates a coin in "Fine" condition from one in the lower "Good" condition. In better condition, with just slight wear on Liberty's gown and the eagle's feathers the grade is "Extremely Fine". The Seated Liberty half dollar is a beautiful and highly valuable coin in this condition. Is your half dollar even nicer looking than those in the grading images? You may have an uncirculated or "Mint State" coin. Mint State, referring to a coin that has never circulated, is sometimes difficult to detect. And, the mint state Seated Liberty half dollar value is $350 plus. If your coin is close to a better "grade" and you are not sure? Rare coin auctions and dealers always have listings of the Seated Liberty half dollar. Their prices usually include a notation of what makes the coins desirable and the NGC or PCGS assigned grade. Additionally... these coin dealers are potential buyers of your coins. 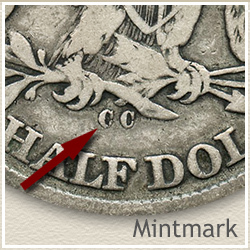 The "CC" refers to the mintmark, indicating the origin of the coin. The "CC" mintmark located on the reverse below the eagle attributes your coin to the Carson City mint in Nevada. Highly sought by dealers and collectors. The other mintmarks "O" for New Orleans and "S" for San Francisco are found in the same location. Some of these have values in the hundreds of dollars. Other varieties, for example, "arrows at date" is easy to recognize. The "with motto" coins have the phrase IN GOD WE TRUST over the eagle. 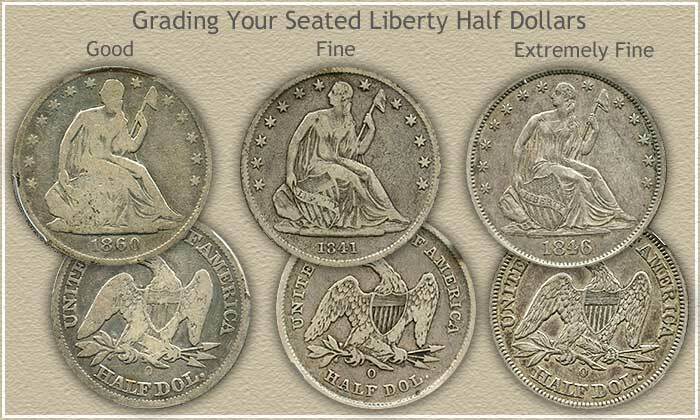 All these different mintmarks and varieties make the Seated Liberty half dollar a popular coin to collect. 1) They are always in demand. 2) The better condition coins are treasured by collectors. 3) Dealers are in constant need to fill this demand. The above three reasons assure the Seated half dollar future value is bright. Consider your group of coins as the beginnings of a coin collection. The start of an enjoyable and rewarding hobby. If that is not for you, one successful approach is to sell all your coins and use the proceeds to buy one nice rare coin. The one you were hoping to find in the box. Pass the thrill of a rare coin on to your children. Check back whenever curious of your Seated Liberty Half Dollar Value. 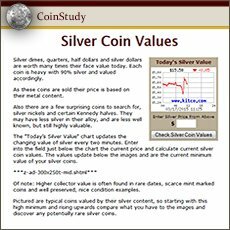 Print the Coin Values Worksheet - link in navigation column - to list your Seated Liberty half dollars and record their values. Should you decide to sell... use the worksheet as an invoice and packing slip when sending coins through the mail to dealers. It indicates you have done your coin values homework.